While I was going through my fabric I decided I have enough odd-sized pieces of fabric to make a fall-ish quilt. It’s definitely full of a big variety of fabrics, but it makes it fun so I’m going with it. I decided on a tumbler quilt after I saw Nettie’s. I used the Accuquilt Go Cutter to cut the tumbler shapes and it went together easy. There’s no doubt this is one colorful quilt! It's great! How will you border/finish it? Just curious… I've been eyeing that die! That's gorgeous! I love your colour choices. I made a tumbler quilt years ago and an accuquilt go cutter would have been very handy to have. I cut the sides flush to make it easy to bind as I was a beginner back then. Actually, I probably would do the same thing today. No patience, ha ha. I can't wait to see how you quilt and bind it. What size is yours? So pretty! Love the tumbler shape and fabrics are so lovely and colorful! Nice quilt! I think I must have made a dozen tumbler quilts when I first got my cutting system. We must all go through that! No cutter, but I think I'd like to try the tumbler quilt anyway. Love the colors! Love the fabrics you used. Really pretty! I love the pops of color and that shape really brings out the patterns! What a beautiful quilt. I love all the fabrics you selected. Wow, it's beautiful! Love it! the colors are perfect for that summer/fall transition, when the leaves are just starting to turn and there is still color everywhere! Which happens just this time of year here in Texas. I've been wanting to do a tumbler quilt…hopefuly with a GO! (don't have one yet) Your quilt looks very cheerful and I love it! It's colorful, but oh, so nice. I've been wanting to do one of these quilts for a long time, but in more muted colors. Maybe one day I'll get a GO! so I have an easy time cutting out the pieces. This is a really fun quilt to look at! I love the movement those tumblers give it. And I love spying all those fun fabrics. Definitely have to have an Accuquilt Go Cutter to do one of these. Love it! It's busy, but it TOTALLY works! Love it!! I love your quilt! I like the way your colours always go together so well. I love the fabric….perfect for Fall!! How long did it take to piece? I can't wait to see the binding. Thanks for sharing. All colors I just love, the whole year round too. Really great colors for living in the Pacific Northwest when it's cloudy and cold out. It's a beautiful quilt. I always wanted to make a tumbler quilt. Could you share with us the size of the tumblers? Love it! This is one of my favorite patterns. 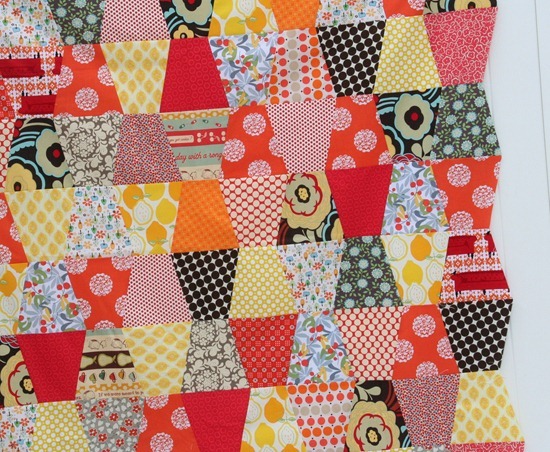 In fact, I have a photo of one of my scrappy tumbling blocks quilts in my blog header. 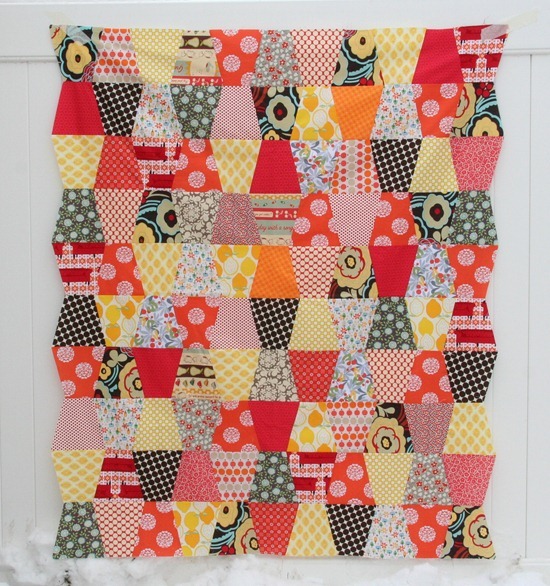 I'm totally addicted to using scraps for quilts just like this. So cute! It's beautiful. Great colors for the season. This is gorgeous – I've always wanted to make one, but without the GC, it would take forever to cut all those blocks! I love this quilt. I just bought a tumbler template from Missouri Star and I can't wait to try it. I need to get more scraps first. I want it to be made of mostly different fabrics like yours. I can't wait to try this.